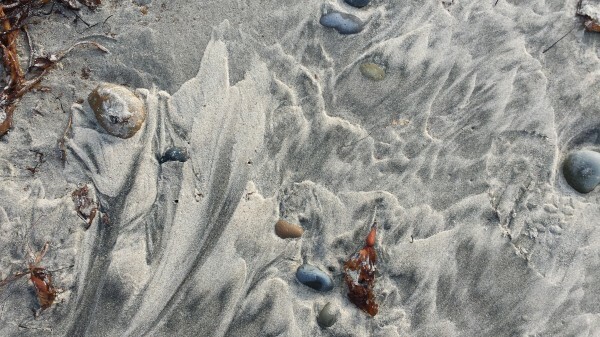 As I think about where my art journey will go next, I marvel at the variety of marks I see on the beach. This looks a bit like frosting, swirled with a wide spatula, spread in celebration and invention. So how can my work celebrate life? How can it define a moment or an emotion or a glimpse of something otherwise hidden? How can it be true and authentic, yet not loudly selfish? What shall it look like, how shall it feel to the touch, what could it present to the eye and mind, how shall I make it? Making gives life meaning for me. Making, transforming, presenting. Preparing food is so direct and immediate; making art is so abstract (even “representational” art is abstract: the painting is not the object as Magritte so dryly told us!) We are having a party at our home this weekend. That will be collaborative performance art, guests included. The ocean makes art every moment of every day. Does it know its own destiny?